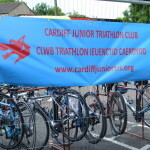 Established almost 20 years ago, the Cardiff Junior Triathlon Club caters for children from 8 years of age to 17 years of age. Whether you are training for fun, general fitness, trying to complete your first triathlon or want to improve your performance, the club offers a friendly training environment. All our coaches are qualified via the accredited British Triathlon Coach education scheme and the club is affiliated to the British Triathlon Federation via Welsh Triathlon (Affiliation certificate). We encourage our members to join these organisations. 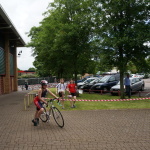 Our training facilities at Maindy Leisure Centre, Crown Way, Cardiff and Cardiff Metropolitan University, Cyncoed Campus both give us the unique opportunity for members to experience a training session including all three of the triathlon disciplines in a safe environment as well as being able to focus training time on the 4th discipline – transition. We currently train on Sunday mornings and Monday evenings at Maindy and Wednesday evenings at Cardiff Metropolitan University Cyncoed Campus – see our Training page for more information. 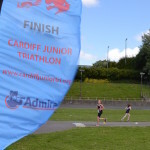 Every June we hold an annual Cardiff Junior Triathlon giving competitors of all abilities the opportunity to complete a triathlon to the relevant age grade distances as listed below. See our Events page for more details and previous results. Interested? Contact us via any of the details listed on our Contact Us page.